How much time did your fertility doctor spend with you? Find out the Infertility Seminar Dates for 2018 and Register yourself for the next upcoming events. IVF Phoenix™ is more than just a fertility treatment center. We are a team of fertility specialists dedicated to helping you realize your dreams of a family. We have been helping people throughout the Phoenix, AZ area, including Scottsdale, Mesa, Chandler and beyond, with infertility and reproductive challenges for more than 20 years. Our Assisted Reproduction Techniques have met with great success and put smiles on the faces of many families. If you have been searching for a fertility treatment center in Phoenix, Scottsdale, Mesa, Chandler, or the nearby areas, rest assured that the care and personal attention you will get at IVF Phoenix™ is second to none. He is not only a board-certified Ob/Gyn but also a Board Certified Reproductive Endocrinologist recently ranked in the top 10% in the U.S. He and his team of fertility specialists will take the time to assess your unique situation and circumstances, and plan a course of action just for you that will maximize the chance of success. We would love to speak with you and see how we can help. If you are ready to put your infertility challenges behind you and have a baby, Call IVF Phoenix™ today. We proudly serve Mesa, Gilbert, Glendale, and the entire Scottsdale/Phoenix, AZ area. My husband and I are so thankful for Dr. Couvaras and staff. We were struggling to have a family and stumbled across the IVF Phoenix website. We are from Canada and the staff was fantastic to deal with and very accommodating to work with. We always had support no matter what time of the day. We now have the most perfect beautiful little boy to complete our family!!! So grateful and blessed!!! Dr. Courvaras is the best there is in the infertility world!! Our first baby is here because of him and his team. Our baby is 17 and will be graduating from high school in less than a month!! We have never forgotten him and the gift he helped us have!! I am a current patient of Dr. Couvaras! My husband and I have been on our journey with him since January. From our first consult to our following appointments....he is awesome! He takes the time to make us feel comfortable, answers all our questions, and brings along his sense of humor (which I enjoy as this journey can be stressful at times) He truly treats each patient as a unique individual and develops a specific plan (journey) for their own needs. The staff member are just as amazing!! They answer every phone call, question, and provide medication support. I highly recommend Dr. Couvaras for anyone struggling with getting pregnant. Feel free to comment or reach out to me if you want. This review is long overdue, but my excuse is I have had a beautiful newborn keeping me busy thanks to the wonderful Dr. Couvaras! Dr. Couvaras is by far the best Fertility doctor you will ever meet. We spent thousands and wasted a little over a year (valuable time I couldn't afford) with another Fertility doctor that happens to be the next door neighbor to Dr. Couvaras' Scottsdale location. After 6 failed IUI's and being made to feel like herded sheep with the revolving door of, "sorry you're not pregnant; call us on your next cycle day 1" and no Dr. Update, I was bewildered, frustrated and heartbroken to say the least. I felt like we had a bit of a bumpy road with a couple of the staff members but ultimately Dr. Couvaras helped us achieve our dream and we now have a perfect 3-month-old. I really appreciate his out of the box thinking and I feel like what he teaches truly works. I never felt healthier than when I followed his protocol. Kara, Angie, and Shalena are all shining stars that I felt 100% comfortable with. I am a realistic person and I do understand that in life nothing is perfect but I do think it's worth mentioning that there was a staff member that I felt uncomfortable with and it did taint the experience a little bit and that is unfortunate. I have and will always recommend this practice and will be forever grateful for my little miracle. Thank you IVF Phoenix! My wife and I welcomed our first child in October thanks to the team at IVF Phoenix! We had a horrible experience at another facility before finding Dr. Couvaras and his team. We were treated wonderfully by all staff members and felt very comfortable with each step of our process. I was able to carry my wife egg and was pregnant on our first try. We can't wait to go back for our next baby! From the moment we met Dr. Couvaras, My husband and I felt totally comfortable, secure, and well informed. Additionally, the nurses and staff at IVF Phoenix provided prompt, efficient care with both expertise and patience. Whether ordering prescriptions, educating me on how to properly administer medications or explaining options and probable outcomes of specific treatment protocols, Dr. Couvaras, and his team were simply remarkable. I never felt alone, and appreciated the close guidance they provided throughout our entire treatment. I couldn't be happier with the results! My husband and I are now 12 weeks pregnant, and are absolutely thrilled! I would recommend Ivf Phoenix to anyone who is interested in finding the cause of their infertility. We love and appreciate everyone at Ivf Phoenix, they are a 2nd family to us. We still can't thank them enough for making our dreams come true! I can not thank Dr. Couvaras enough for blessing my husband and I with the most amazing baby girl. I was at the point of giving up then I decided to go to IVF Phoenix for one last treatment and I'm thankful I did. Dr. Couvaras thinks outside of the box which is what I needed. I know refer all of my friends to him as soon as I find out they are struggling. Thank you IVF Phoenix for everything you have done for my family! Dr. C and his staff are amazing! My husband and I had tried another fertility clinic before IVF Phoenix and treatment after treatment was unsuccessful. We were about to give up, but a friend who had just had success with Dr. C recommended him to us and it was the best decision of our lives to go for it because we were finally blessed with our beautiful baby girl surprisingly after the first try with him! Thank you for our little miracle Dr. Couvaras and IVF Phoenix! The staff and Dr. Couvaras were so kind and understanding. They called me by name as soon as I walked in. Dr. Couvaras was incredibly knowledgeable and knew from the first visit what was going on and after tests came back he was 100% right. He was informative, personable and took care of my health needs as a priority. I never felt left on the back burner. Innovative for sure because now I have 3 amazing children! I absolutely love Dr. C! We tried to get pregnant for 5 years! Without him, I wouldn't be holding my 1-month-old baby! He Tells you how it is- and has a great sense of humor! I was always kept in the loop with things, and talked to like a human! We tried MANY different things to try to raise my husband's Sperm count before moving into donor sperm. The staff was absolutely amazing! Beautiful office and always clean! He is an amazing Doctor. I have Hashimoto's and MTHFR and he knew how to work with these not just offer more testing like the other Doctor Book an appointment. Don't delay. He is the best in the Mesa/Gilbert area Smaller office and not a factory where you felt like a number. Also does not push Ivf in the first meeting. Smart caring and has incredible insight From beginning to end he looked at the problems I was having and worked on getting me better before trying to make a baby. It worked! All the staff is so helpful. They were available weekends and after hours Awesome. Modern clean. No clutter. Convenient. They helped us set up an HSA to benefit from the tax incentives. They care! Dr. C is very smart and will show you lots of information, graphs, charts, diagrams, sometimes it's too much but I always felt, 100%, that I knew the what, why, when and how! I feel blessed to have been able to navigate my infertility journey with him by our side. I absolutely love him! (He's funny too!) Be upfront, have questions ready ahead of time and be ready to learn a lot ! Dr. Couvaras took time to explain every step of the way. He showed compassion during time of loss and happiness during times of joy. He hugs you, remembers you and treats you like a friend if he sees you out in public! He's an amazing human himself! f you are looking for a doctor to help you get the family you have been dreaming of, look no further! Dr.couvaras came highly recommended by multiple people and I'm glad I followed their recommendation. He takes his time to really figure out the issue and does not just assume the problem or shoot from the hip. We had to do IVF procedure and his staff was truly amazing the whole way! Kara who picked up as my nurse was a breath of fresh air who truly cares. Angie is awesome if you need IV's, or blood drawn she is very good, Jennifer is the ultrasound tech who is another sweetheart and Shelina is front desk who is very prompt at getting back to you with any questions you may have. They are a great team and really helped me during the process. Highly recommend him, without him I would not be pregnant with our little angel! I can't thank you enough Dr.Couvaras! I first met Dr. Couvaras when he was volunteering his time to help improve the practice of medicine in Arizona, including advocating to restore health care for low-income children and families. I have met so many people positively impacted by Dr. Couvaras' that have successful families thanks to his prudent, smart medical care. Years later, I would love from being his colleague to his patient. He quickly identified an underlying medical issue for me, and I am on the path to health! He is very respectful of my family and personal choices. I highly recommend Dr. Couvaras and his bright, helpful staff. Thank you to Dr. Couvaras and his amazing practice manager, Rhoda, for giving me personal confidence, increased health, and equality in medicine. We now have an amazing 1-month-old son thanks to Dr. C and Rhoda! We definitely will be returning for our next. Thanks for always being there for us! Best practice in town! I have used Dr. Couvaras for my first and second pregnancy. He takes the time to diagnose exactly what the problem is. His office staff is great and incredibly welcoming. The knowledge this practice has and the flawless work that Dr. Couvaras does completely exceeds our expectations. With years and years of experience, I would trust this man with my life. I am thankful for him for my 2 1/2 yr old boy and this sweet little bun in my oven. I believe this is the first time I've reviewed anyone or anything online- I had to do it. Dr. Couvaras is simply the best. If you're reading this because you're trying to pick the best possible Dr., you can stop your search, you've found him. Don't waste any more time, pick up the phone and make an appointment. You will not be disappointed. Dr. John Couvaras is a brilliant and compassionate physician who has devoted his career to helping women achieve successful pregnancies. Deserving of the utmost respect in his field, and particularly by patients. This is a physician who is helping those of us in desperate infertility situations. If you are, as I have been, an infertility patient, remember to be kind and respectful to Dr. Couvaras. He spent many sleepless nights and made a huge financial investment in his education and extra training in becoming an Infertility Expert. I believe in Karma. Treat those who are helping you with appreciation and respect and you might find that things tend to fall into place. Be blessable. Attitude and appreciation go a long way towards success in any endeavor. Thank you Dr. Couvaras for putting up with us when we are not who we should be. You deserve our grateful respect, and I am sorry if you do not always receive it. I am very pleased with my experience with Dr. John Couvaras. He truly understands what you are going through and you can hear the hope in his voice that he has for you. And his staff is excellent, caring and compassionate. Dr. Couvaras and his staff are the best! My husband and I were referred to him by a previous patient of his who successfully got pregnant after years of trying with no success from other fertility doctors. We went to a seminar he held at his office and it was a great way to understand his philosophy and personality. We liked him immediately. He also does not push IVF but tries to understand the underlying issues. Dr. Couvaras helped us conceive twins and I'm so grateful for all his help. His staff is very approachable and professional. You can text them any time of the day. 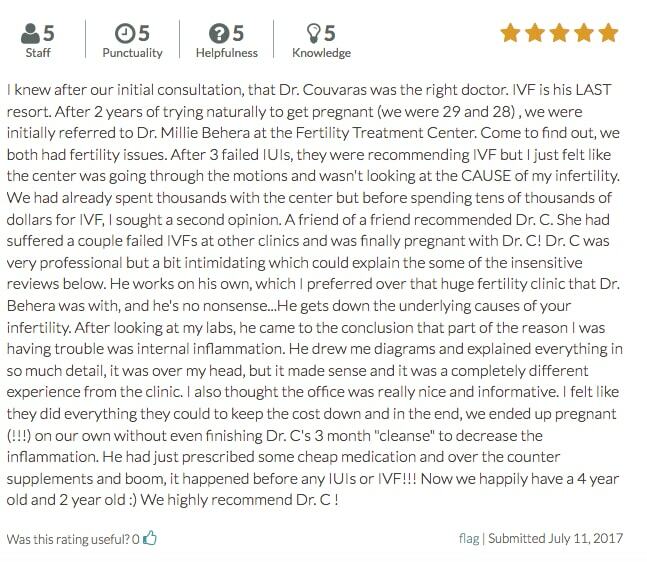 I always had a positive experience there and would highly recommend Dr. Couvaras to anyone having fertility issues. If there were more stars to give I would give them more. They made me feel so welcome after having a very bad experience with another clinic. Throughout my process, I had amazing interactions with the entire staff. They were so helpful and caring to my wife and I. We are now expecting our first child and I already cannot wait to go back for our second! As I approached 40 I decided to see a fertility doctor to see what my options are for being able to have a child. One of the doctors I met with was Dr. Couvaras who had a more unique approach to having my system respond to a pregnancy. The protocol he used after analyzing my history was very impressive as well as unconventional (compared to other options I had been given). By boosting my body's own immune system he was able to get me to the point where I became pregnant naturally and without further intervention. I have a beautiful baby today thanks to Dr. Couvaras! to talk about the latest advances in fertility. What makes IVF Phoenix the premier choice for infertility clinic services in the Phoenix metro area. Call us now 602.765.2229 (BABY) to schedule your appointment or email us at info@ivfphoenix.com with your questions. We look forward to meeting you.